Tuscany, a worldwide name that needs little introductions and here we are lucky to live and work, exactly in the middle of this beautiful region. Staying in Linearis- Sertofano farm you will have a simple and finished house in the country and the possibility to discover, by short transfer, little and big beauties, with lovely landscapes, great histories and exciting cities of art. The visit of the most beutiful worldwide cities of art, as Florence and Pisa, distant just 25 minutes by car, is obliges. It's exciting to get lost among the streets of this beautiful cities, making social life between shops of art, antique trade, shopping and museums, eating a sandwich or have a candlelight dinner, eating the famous tuscan steak “fiorentina” or take a coffe and an ice cream in any square simply. It will be sufficient go out from the touristic streets to discover the cities really, leaving their mask of big city of art. Siena, city of the horses, celebrates in 2 July and 16 August “Il Palio” organized in “Piazza del Campo” the famous and unique shell-shaped square, heart of the city and meeting place during the hot summer evenings, to relax sitting on the ground. It will be beautiful get lost among a lot of little village, rich of history and culture, presents on the territory; little architectural masterpiece and evidence of great taste and big passion that created this country and.....buy the craft cheese or the fruit during market days. In the surroundings there is San Gimignano, medioeval town, city of towers and Unesco heritage, lively village in the summer with its events in the Cisterna and Duomo squares. From here you can go to Castelvecchio, a castle in a mysterious place in the middle of the wood, perfect for the trekking lovers, one of the many routes in the area. On the same street you can continue to Volterra, set between the Volterrane salt flats, characterized by their typical landscape. From here it's possible to reach the sea, just 1 hour from our Farm or walk through the pinewood or meet the sea....simply. On the coast, always in 1 hour, it's possible reach Pisa and Livorno to eat a yummy “caciucco” or drink a tangerine punch, and for all tourists it's important don't miss a visit of the famous leaning tower of Pisa. 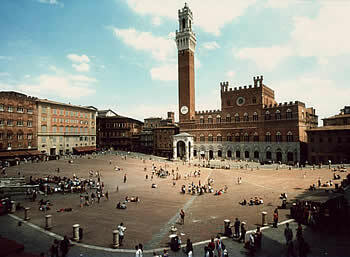 Lucca is more far, 1 hour and half, to visit the little streets and the nice oval square. Then if you don't want have a dinner at home, in your garden, in front your pool, you can choose between small restaurants, so many and delicious, around the little villages, where taste the excellent and genuine typical cousine, as in Barberino Val d'Elsa or in Tavernelle Val di Pesa for your happy hour of the Tuesday and to visit a typical market in the street of the country. Poggibonsi is bigger city, here you will find all important services. The city is just 2 km and it has a beautiful fortress, where in the summer are organize outdoor events, the pretty “Fonte delle Fate” and an archeological park. 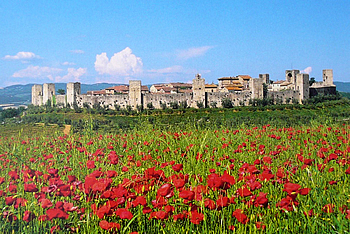 Then Monteriggioni, fortified city, Colle Val d'Elsa, Casole d'Elsa, Vico d'Elsa, Sant'Appiano, Certaldo, native city of Boccaccio, Vinci where search Leonardo da Vinci's track. Petrognano Semifonte and its Dome, built with the characteristics of Bruneleschi's Dome, when Semifonte lost against Florence the Indipendence War. Or you are garden lovers? In Tuscany there are so many, near the Villas. Siena the charm of the “Crete Senesi” with the sunflowers, the poppies, the grain and the sunsets between the hilly colours. 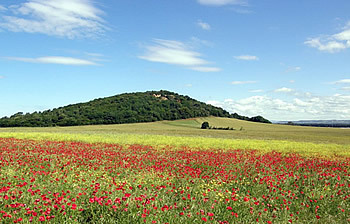 Pienza, Montalcino and the area of Brunello production, famous wine. 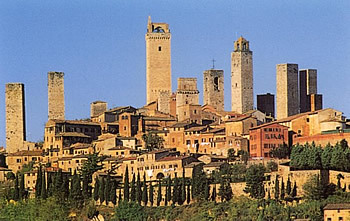 And Arezzo, nice little town with its antique market or Cortona near Trasimeno Lake, accessible just in 1 hour and half. Perhaps some of you will find the “Via Francigena” and “Via Cassia” between the fields and the current streets or will go in natural parks and protected Oasis. In the end, but not for less importance, the Chianti, we are in the Geographic Chianti, and a few km start Chianti Classico, both places of wine production. You can choose to visit the so many castles, fine wines or extravirgin olive oil producer's big estates where taste all typical products. Aren't you interested? 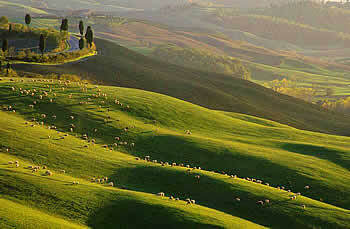 Maybe a horse riding around or play tennis, booking a tennis court in Poggibonsi.